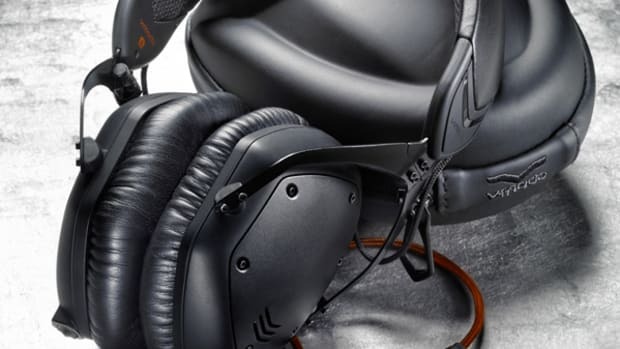 The Crossfade M-100 Professional DJ Headphones are the newly announced V-MODA creations that DJ&apos;s and everyday listeners and smartphone users are sure to love. The 50mm dual-diaphragm drivers produce extremely accurate sound reproduction with superb isolation. The M-100&apos;s also have a Metal steel-frame construction with metal CLIQFOLD hinges that allows them to fold and dual inputs to daisy-chain additional headphones for share-play. Check out the full HD-Video and written reviews after the jump. V-MODA, the new pro-headphone company, has been delivering some of my personal favorite DJ headphones to date and I’ve been using the Crossfade LP2’s and V-80’s in the DJ booth for performances and for all around listening on my laptop and smartphone. They never let me down during a gig and they hold up to lots of abuse. The V-80/M-80 have an on-the-ear headphone design (40mm drivers) and we reviewed them a few months ago found here. The Crossfade LP2’s are very similar, with an over the ear design (50mm drivers) which have slightly bigger sound and better isolation. The LP2 review can be found here. 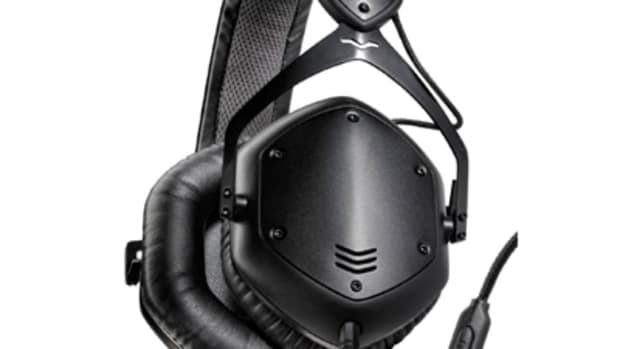 The Crossfade LP2’s have a very similar design to the latest offering from V-MODA called the new Crossfade M-100 Professional DJ Headphones. If you take a quick glance, you may not even notice the differences between the LP2 and the M-100, but when you break them down inch-by-inch you start to see some of the differences and refinements that have been made with the M-100’s. Like the V-MODA Crossfade LP2 headphones, the new M-100’s are designed with extremely high-quality standards in mind. The V-MODA Crossfade M-100’s takes the original LP2’s design to deliver a more refined sound quality and adds the new CLIQFOLD hinge that now gives the user an option to fold the headphones into a smaller form factor for easy transport and storage. The V-MODA M-100’s come in three base colors including Matte Black (reviewed), Shadow, and White-Silver. The matte black color scheme of the review unit is completely blacked-out in every area and they are really fashionable and have a nice overall aesthetic to them with interchangeable earcup shields for complete and personal customization. The V-MODA M-100&apos;s have removable metal faceplates on each earcup that can be replaced with other designs or custom logos (sold separately). 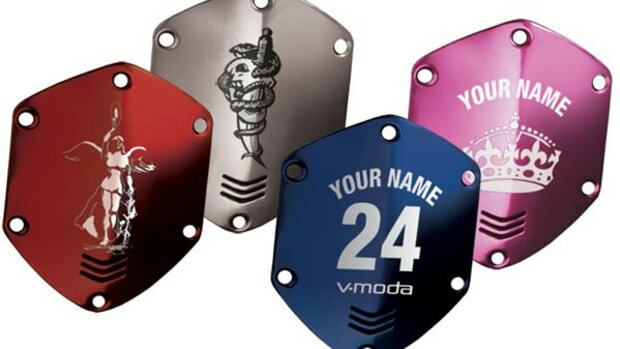 All you have to do is go to the V-MODA website and upload your image or post your text and they’ll make you some custom shields to set yours apart from the rest. For a limited time from now until the M-100’s release, V-MODA is accepting pre-orders with a custom set of shields included for only $10 extra. 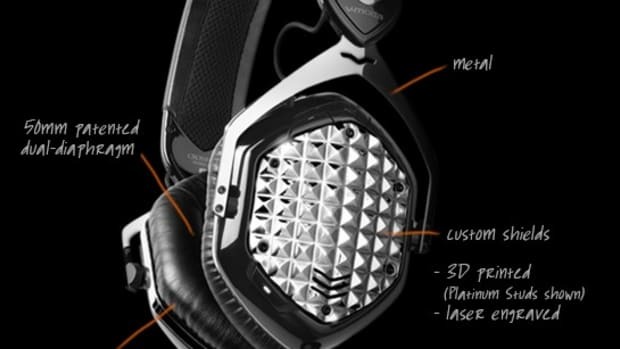 The V-MODA Crossfade M-100’s are mostly made out of metal and they feel nearly indestructible. There is some plastic in design to save on weight, but the shields, Frame, and headband all have steel reinforcements meaning they’ll withstand abuse for years to come. At the top, the padding on the headband is about an inch thick and provides good cushion for long performances or extended usage. The top of the Headband can bend and flex in ways I did not think was possible, while the actual sides that connect to the earcups (a common point of headphone failure) are all metal and built to last. The all metal horse-shoe shaped brackets that actually holds the earcups now each have a CLIQFOLD (centerfold) metal hinge that allows each earcup to fold neatly into the headband. I’m extremely happy to see that this folding hinge section is all-metal for durability and has a locking-click to them when they are extended or folded into their final position. The only gripe that we had with the Crossfade LP2 review was that we could not fold them into a smaller form factor. V-MODA listened to the people with this issue and has now changed the design to accommodate us. I have to give big kudos to the V-MODA team for actually paying attention to the end user and implementing the changes in a very timely manner. The earcups themselves are over-the-ear style 50mm drivers which were big enough to cover my whole ear very comfortably. They did a superb job of isolating the outside sounds from interfering with my monitoring needs, even though they did not have any powered noise cancelling features. The memory foam in the earpads is very comfortable and they are now fully user replaceable. So if the earpads ever wear out or get damaged, replacements can be obtained directly through V-MODA. The earpads are really soft and plush with a leather covering surface. These things are very comfortable throughout long periods of DJ use. I used these headphones in the DJbooth for a recent performance and the DJ monitoring performance of the V-MODA Crossfade M-100’s was right on par or better than all the other professional-grade headphones that I have tested and reviewed in the past (ie BEATS PRO, Xone XD:53, Technics RPH, etc..). The monitoring volume of the Crossfade M-100’s is very loud and very clear. 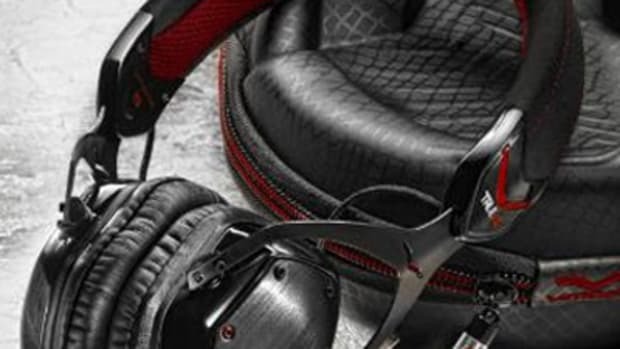 The Crossfade M-100’s come with a compact hard carry case called the Exoskeleton Case which provided more than enough protection for these cool headphones while also looking stylish in the process. There is enough room in the case to hold additional small supplies such as USB flash drives and an extra DJ stylus or headshell. The Case also has two removable Velcro pouches that can be used to carry the extra cables or other DJ goodies that you may need. The V-MODA Crossfade M-100 headphones also comes with (2) Kevlar reinforced cables that are built to last for the lifetime of the headphones (or more). One of the two Kevlar cables have a one-button remote and Microphone built-in for smartphone usage and one-touch dialing. The other black Kevlar cable is the Share-Cable that has a small 1/8th-inch output extension on it that can be used to allow other headphones to connect to it to share the listening experience. 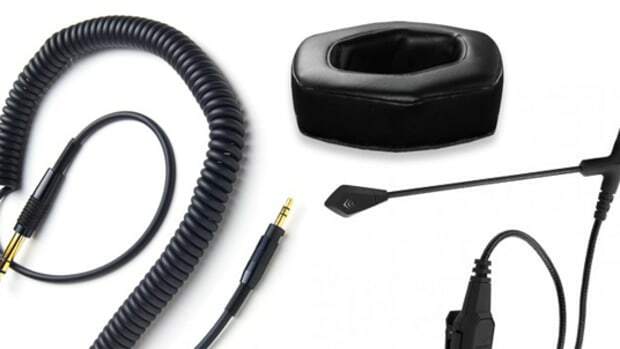 The cable can also be used for all other listening and monitoring needs as well. The headphones also come with a gold-plated quarter-inch adapter to connect to other devices. One of the new and exciting features of the M-100&apos;s is the ability to connect additional headphones to them to share the music to others. At the bottom of each earcup there is an 1/8th-inch output connector so that users have a choice of which earcup they want to plug in their audio source and they can also now daisy-chain additional headphones to the free/open 1/8th-inch port. This is a really cool feature that will allow DJ’s to share the monitoring experience during performances or for casual users to share whatever they are listening to with a nearby friend. I plan on using the feature with wifey on a Plane for our next trip, but during our tests the sound was really good and it was a great way to share my music on the go. You can also use the aforementioned Share-Cable to share the listening experience as well and you can use both share-play features simultaneously to give two more users a good listening experience. When using the Share-Play features the volume of the headphones decrease to about 70% which still makes for a great listening experience but it&apos;s worthy of a note. Also, the volumes for the additional headphones that are sharing the listening experience will be decreased as well. The Sound quality of the V-Moda Crossfade M-100 Professional DJ headphones is fantastic! The V-Moda M-100’s are pretty different from the V-Moda LP2’s in the sound department even though they use some of the same parts within their construction. The older Crossfade LP2’s have a more “raw” sound to them with bass that vibrates and resonates a bit harder than the mids and the highs. The V-Moda Crossfade M-100’s have a more “refined” sound that still has very deep bass, but is delivered in a more-controlled manner that also leads to crispier highs and extremely accurate sound reproduction in the mids. The highs and mids are a bit more clear and legible with a better sense of balance between them all. The earcups house 50mm dual-diaphragm drivers that deliver good volume levels for the lows, mids, and highs that never drown each other out nor did I hear any bleeding-through of the highs over into the lows or vice-versa. The 50mm dual-diaphragm drivers were more than adequate enough to produce very loud sound without distortion or feedback. Even at super-high volumes, distortion was basically non-existent. They deliver excellent 3D quality sound all around, with the use of their V-Port airports located on the rear of the earcup shields that allow air to circulate without causing sound leakage. 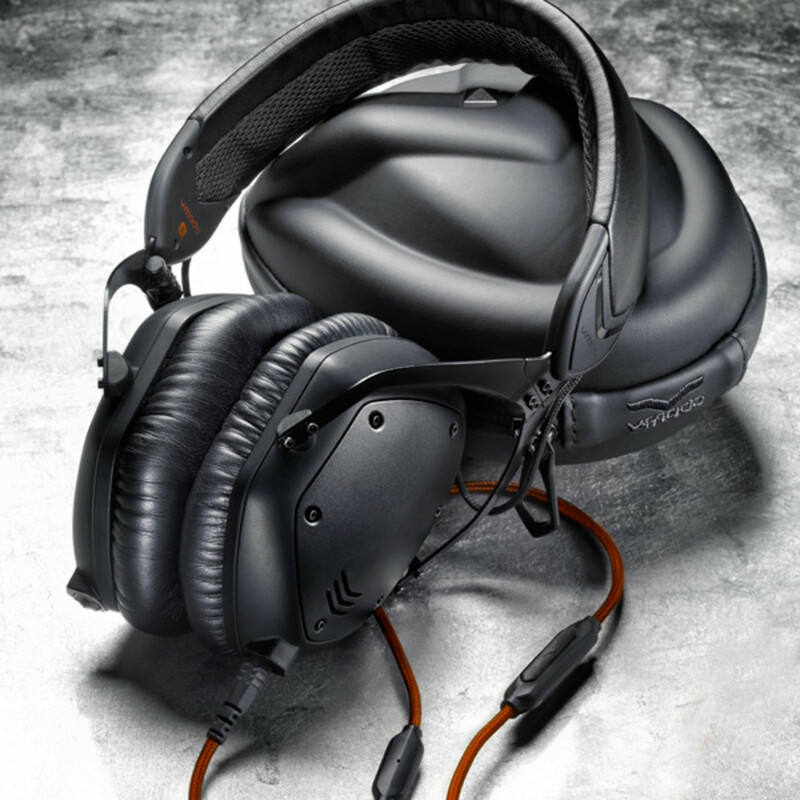 Like the V-Moda Crossfade LP2’s; the M-100 headphones receives very high grades when it comes to the sound department. Every time I review a set of V-Moda headphones, I am blown away by the whole package…so much so that I am never able to give them back and I always end up keeping them as my new “Premier” set of headphones that I use consistently. The same can be said for the new V-Moda Crossfade M-100 headphones. The M-100’s have a rock-solid Durable Metal (Steel-Frame) construction with the new Cliqfold metal hinge design for easy transport and storage. The M-100’s are very lightweight and comfortable while providing professional and refined sound with excellent sound isolation and low leakage so the sound stays where it’s supposed to be. The M-100’s also has dual inputs so users can daisy-chain additional headphones for share-play and they come with two reinforced Kevlar cables for smarphone and professional gear use. The only minor gripe that I could find with the headphones is that the M-100’s don’t have the 360-degree swivel that some DJ’s use for their monitoring style, but this will only pertain to certain DJ’s who must-have this feature. For everyone else, the V-MODA Crossfade M-100’s are sure to bring a huge smile to your face as it has done with me many times over. The new improvements in sound and in construction are worth the $300 price point and for a limited time you can get custom plates for only $10 extra. I am going to recommend the new V-MODA Crossfade M-100 Professional Headphones to any DJ who wants an unmatched and refined monitoring experience that they can use for performances and general all-around listening needs on any device. The V-MODA M-100’s are now my personal “go-to” pair of headphones and you too should consider getting a set of your own if you are in the market for a new set.